Review of Wang Lixiong: Wo de Xiyu, ni de Dongtu, Taipei, Dakuai wenhua (Locus Publishing), 2007, 472 pp. It is a common assumption that Chinese intellectuals, however critical of their government, its institutions, and its policies, are unreceptive to calls for greater self-government, much less independence, in China’s autonomous regions, most notably Tibet and Xinjiang. It is therefore worth taking note of Wang Lixiong’s book on Xinjiang, published in 2007 in Taiwan, the title of which can be rendered as My Far West, Your East Turkistan. Wang Lixiong is no newcomer to the question, having devoted the past two decades to researching and reflecting on the place of “ethnic minorities” in China’s political system, in particular in view of its possible democratization. Born in 1953, Wang took part in the Democracy Wall movement in 1978 and, in the aftermath of 1989, published the “political fantasy” novel Huang Huo (Yellow Peril or Yellow Disaster) under the name Baomi (1991; an English translation was published as China Tidal Wave, translated by Matthew Dillon, Hawaii UP, 2007). In the 1990s, he began researching and writing a book-length study of Tibet, published in 1998 under the title Sky Burial: The Fate of Tibet (Tianzang: Xizang de mingyun), and resigned from the Writers’ Association in 2001. 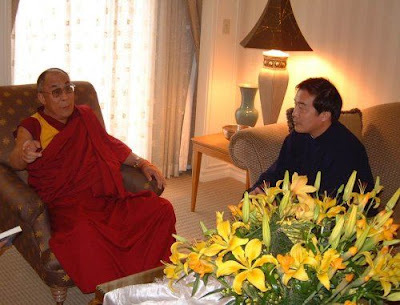 In a follow-up to the book, he met the Dalai Lama (in the United States) for a series of talks, published in 2002 under the title Dialogue with the Dalai Lama (Yu Dalai Lama duihua). Wang Lixiong first began to study Xinjiang in 1999, when he travelled there to prepare research for a book along the lines of Sky Burial. He was arrested for photocopying an internal publication, stamped as “secret,” on the Xinjiang Production and Construction Corps (the notorious bingtuan), and attempted suicide in a high-security prison in Miquan before recanting and promising to collaborate in order to obtain his release. He recorded the incident in a short essay entitled Memories of Xinjiang (Xinjiang zhuiji), published in 2001 and reprinted as an introduction to the present volume. In prison, he shared a cell with a Han prisoner accused of economic crimes (“Uncle Chen”), and a Uyghur prisoner arrested in Beijing for organizing a demonstration protesting discrimination (Mokhtar), with whom he entered into a long and ongoing discussion on Xinjiang that forms the backbone of the book. In the form of memories of prison conversations with Mokhtar, Wang Lixiong sketches out a preliminary analysis of the “Xinjiang problem,” which he believes has entered a phase of “Palestinization.” He begins with some anecdotal examples of what he calls the Han “colonial attitude,” citing the resistance to “Urumchi time” among local Hans, and their worship of Wang Zhen (1908-1993), Party secretary of Xinjiang from 1949 to 1955. Wang shares the view of a nationalist or at least cultural-nationalist revival in Chinese political discourse, initiated by Deng Xiaoping and reinforced after 1989. One may note that the main themes of this discourse (five thousand years of history, the “humiliation” of the Opium War and imperialism, anti-Japanese feelings) are not particularly conducive to appropriation by other ethnic groups, and indeed are sometimes downright detrimental (e.g., the emphasis on the Qing empire and the civilisation it purportedly brought to frontier regions such as Xinjiang). In this sense, Wang believes that the “Xinjiang problem” is largely a self-fulfilling prophecy” (p. 61) in which an important role was played by the famous yet still mysterious “Document No. 7” issued in March 1996, the first to conflate separatism with “illegal religious activity.” In this situation of mutual distrust, all efforts to stimulate the economy, no matter how profitable, were inevitably seen as colonialism. And in fact, Wang concludes that Han inhabitants of Xinjiang were able to reap an overwhelming share of the benefits. New Han farmers took over the land from Uyghur farmers, effectively colonizing Xinjiang’s agriculture. From 1990 to 2000, according to official statistics, the Han population in Xinjiang increased by 1.8 million people, or over 30 percent. This introduction is followed by three other substantial sections. The first is a travelogue of Wang’s four subsequent trips to Xinjiang between 2003 and 2006. It is followed by another long dialogue between Wang and Mokhtar. The final part is comprised of three “Letters to Mokhtar,” which conclude the conversation and sum up Wang’s main points regarding the difficulties of Xinjiang independence. Wang Lixiong does not write as an academic, nor does he give much background, even of a journalistic nature, but draws only on his conversations with various people in Xinjiang. Although somewhat problematic, this no doubt makes his findings more accessible to ordinary readers, and more plausible to Chinese readers who are not knowledgeable on the subject. He thus reports with considerable first-hand detail on deepening urban segregation and growing nepotism and corruption, highlighting the monopoly on mineral water held by Party Secretary Wang Lequan’s son-in-law. He then goes on to highlight three main aspects of Xinjiang’s socio-political system: the colonial economy and control of resources by Han officials (in particular within the bingtuan system), the education system, and more generally the politics of cultural uniformization, concluding that government policy on Xinjiang requires urgent revision. The full text of this review essay is published in China Perspectives, 2008.4. In 1980, the Xinjiang People’s Congress decided to switch to “Urumchi time,” two hours behind Beijing time, but abandoned the idea in the face of resistance by local Hans. When Wang Zhen, State Vice-President and one of the “Eight Immortals” (influential in the 1989 crackdown) died, his ashes were scattered in the Tianshan mountains in accordance with his wishes. Uyghurs manifested their outrage by refusing to drink water from the Tianshan, which they believed had been sullied. Politburo member Wang Lequan became deputy Party secretary for Xinjiang in 1992 and acting secretary in 1994, and has served as full Secretary since 1995, in violation of the official policy to rotate provincial secretaries at least every ten years. Wow, I didn't know that Wang Lixiong had attempted suicide while in prison. He's got some cajones on him to go on writing things that he knows will upset the powers that be after that kind of experience. I've always had the feeling that there's something relevant about Woeser and Wang Lixiong that I don't know. How do they get away with pushing the limits as much they do? A friend of mine from HK believes that one or the other them must have at least one friend in a high place, who can keep them safe on a longer leash than other writers would get. Another acquaintance argues that Wang Lixiong and Woeser exaggerate a lot, perhaps even make things up, in order to make their stories seem sexier for the international audience. If that's true, maybe the story of his suicide attempt is not so autobiographical after all. I suppose another perspective would be that there's nothing to explain here, that writing what they write isn't really such a big deal in today's China. I have to consider this seriously, since I have only the crudest methods available to me to estimate how dangerous their line of work is. Still, the question that leaves is, if this sort of stuff is not repressed, where are the other Wang Lixiongs and Woesers? Granted, there are other Chinese dissident authors, although I don't know whether and which fit quite into Wang Lixiong's niche. But, really, where are the other Tibetan dissident authors? Who is like Woeser?